Your access and use of the Site may be interrupted, from time to time, for any of several reasons, including, without limitation, the malfunction of equipment, periodic updating, maintenance or repair of the Site or other actions that Ryder, in its sole discretion, may elect to take. Ryder reserves the right to suspend or discontinue the availability of the Site and/or any portion or feature of the Site at any time in its sole discretion and without prior notice. You Must Maintain the Security of Any Password Issued to You. If the Site requires you to create a password to use certain portions of the Site, then it is your sole responsibility to maintain the security of that password. You agree that Ryder shall not be liable for any loss that you may suffer as a result of the authorized or unauthorized use of your password by a third party. You shall not allow any person under the age of 18 to use any Service via your registration or password. The inclusion of any products or services on the Site at a particular time does not imply or warrant that these products or services will be available at any time. In addition, it is possible that certain items on the Site may be mispriced or unavailable, and Ryder may experience lags in uploading updates throughout the Site and in Ryder’s advertising on other websites. The color you see on the Site may not match the product color, as the display of the color depends, in part, upon the monitor you are using, as well as inventory availability. Certain weights, measures and similar descriptions are approximate and are provided for convenience purposes only. Ryder cannot and does not guarantee the accuracy, completeness and reliability of information on the Site, including prices, product images, specifications, availability and services. The publication of any price does not guarantee that such price is available for the product or service at the time you seek to purchase it. Unless otherwise, stated prices do not include taxes, fees, transportation charges, licensing, surcharges, fuel charges or other ancillary, related or additional changes that may be related to the transaction. Ryder reserves the right to change or update information and to correct errors, inaccuracies or omissions at any time without prior notice. All descriptions, images, references, features, content, specifications, products, services, and prices on the Site are subject to change at any time without notice. It is your responsibility to ascertain and obey all applicable local, state, federal and international laws (including minimum age requirements) in regard to the possession, use and sale of any item purchased from this Site. By placing an order, you represent that the products ordered will be used only in a lawful manner. Ryder’s Sites may be subject to additional terms and conditions or policies specific to a certain Site. Prices and availability of products and services are subject to change without notice. Ryder reserves the right to revoke any stated offer and to correct any errors, inaccuracies or omissions including after an order has been submitted and whether or not the order has been confirmed and your credit card charged. If your credit card has already been charged for the purchase and your order is cancelled, Ryder will issue a credit to your credit card account in the amount of the charge. Individual bank policies will dictate when this amount is credited to your account. If you are not fully satisfied with your purchase, you may return it in accordance with Ryder’s Return Policy. Vehicles shown on the Site are for general illustration only. Vehicle availability may be limited. All vehicles and equipment selected in a reservation is subject to Ryder’s standard rental requirements and availability at time of pickup. Ryder reserves the right to substitute vehicles and equipment at the time of pickup. A vehicle reservation only guarantees the rate once confirmed with a deposit, and shows a customer’s preferences for a pick-up location, drop-off location, time of rental, date of rental and equipment type. The pick-up location, drop-off location, time of rental and date of rental selected in a reservation is a preference only and, if a preference selected is not available, Ryder reserves the right to offer a customer alternatives. Rates reserved online do not include applicable taxes, fees, surcharges, additional accessories, protection plans purchased at the time of rental, any required refundable deposit, or other applicable charges. Charges will be provided at the time of pick-up. Rates reserved and listed are only valid at the location specified, for 30 days from the date the reservation is made. If you choose to pay for a rental with a credit card or debit card, you must present your credit card or debit card at the time of rental. You must also present two forms of current, valid identification from the individual signing the rental contract. Acceptable forms of identification include: a valid U.S. issued Driver’s License, State Issued Identification, Passport, Social Security Card, Vehicle Registrations, Phone Bill, Military ID, major credit card and paycheck or pay stub. One ID must be a valid U.S.-issued Driver’s License from all drivers of rental equipment. Proof of insurance is required at the time of pick-up. If you are unable to provide proof of insurance and/or your insurance does not offer sufficient coverage for a vehicle, you will be required to select and purchase a Ryder protection coverage option prior to renting the vehicle. Online prices and selection generally match those in Ryder’s stores, but may vary. Ryder may, in its sole discretion, terminate any account you may have on the Site at any time. You are personally liable for any orders that you place or charges that you incur prior to termination. The Site in no way constitutes an offer for the sale of goods or to provide a service. Specifically, the Site does not constitute an offer to buy, sell, lease, rent, or maintain vehicles from Ryder or to provide any vehicle warranties, equipment, products or services of any kind. Photographs of vehicles listed for sale are photographs of the actual vehicles unless otherwise provided (or disclosed); however, their color and general appearance may appear differently based on your monitor and color settings. For this reason, please contact the Ryder location where a vehicle is located to confirm the accuracy of the contents of the Site before you visit that location. In addition, prices, special offers, guarantees and warranties, if any, are subject to change without notice. Mileage listings are estimates and are not necessarily accurate odometer readings. Some vehicle information and vehicle pricing may be missing or inaccurate, and may be considered invalid and not honored, in Ryder’s sole discretion. Daily changes in inventory may result in the unavailability of certain vehicles listed for sale on the Site. Any currency conversion herein is an estimate. When an exact currency conversion is required for the sale of a vehicle, such will be calculated based on the official currency conversion on the day a vehicle is sold. The Site may act as a venue, through its blogs and other forums (collectively, the "Blogs"), allowing the users of the Site to contribute information and make statements ("User Generated Content"). Ryder is not involved in the actual transmission of User Generated Content provided for in the Blogs. As a result, Ryder does not approve or endorse any User Generated Content in the Blogs, and you hereby acknowledge and agree that Ryder has no control over the quality, correctness, timeliness, safety, truth, accuracy or legality of any User Generated Content provided by you or any other person or entity in the Blogs. You may find User Generated Content posted in the Blogs by other users to be offensive, harmful, inaccurate or deceptive. Please use caution and common sense, and do not rely solely on User Generated Content published in the Blogs. Without limiting the generality of the foregoing, and although Ryder does not regularly review User Generated Content provided for in the Blogs, Ryder reserves the right, but not the obligation, to remove or edit any User Generated Content in the Blogs. Immediately report problems with the Blogs to Ryder at webmaster@ryder.com. If you transmit, submit or post information to the Site that is not Federally trademarked and/or copyrighted, you automatically grant Ryder and its affiliates and assigns, the worldwide, fully-paid, royalty-free, exclusive right and license to use, copy, format, adapt, publish and/or incorporate any or all such information in any media whatsoever, including, without limitation, the Content (as defined below). Provided that you have obtained prior written permission from Ryder to transmit, submit or post information to the Site that is Federally trademarked and/or copyrighted, you automatically grant Ryder and its assigns the worldwide, fully-paid, royalty-free right to use, copy, format, adapt, publish and/or incorporate any or all such information in any media whatsoever, including, without limitation, the Content. Federally Trademarked and/or Copyrighted information without written permission from Ryder. Ryder’s names, graphics, logos, page headers, button icons, scripts, and service names are trademarks or trade dress of Ryder in the United States and/or other countries (collectively, the “Proprietary Marks”). You may not use the Proprietary Marks without the prior express written permission of Ryder, which permission may be withheld in Ryder's sole discretion. Ryder makes no proprietary claim to any third-party names, trademarks or service marks appearing on the Site. Any third-party names, trademarks, and service marks are property of their respective owners. The information, advice, data, software and content viewable on, contained in, or downloadable from the Site (collectively, the "Content"), including, without limitation, all text, graphics, charts, pictures, photographs, images, line art, icons and renditions, are copyrighted by, or otherwise licensed to, Ryder or its Content suppliers. Ryder also owns a copyright of a collective work in the selection, coordination, arrangement, presentation, display and enhancement of the Content (the “Collective Work”). All software used on the Site (the “Software”) is the property of Ryder or its software vendors and is protected by United States and international copyright laws. Viewing, reading, printing, downloading or otherwise using the Content and/or the Collective Work does not entitle you to any ownership or intellectual property rights to the Content, the Collective Work or the Software. Ryder grants you a limited license to access, print, download or otherwise make personal use of the Content and the Collective Work in the form of: (i) one machine-readable copy; (ii) one backup copy; and (iii) one print copy, for your non-commercial use; provided, however, that you shall not delete any proprietary notices or materials with regard to the foregoing manifestations of the Content and the Collective Work. You may not modify the Content or the Collective Work or utilize them for any commercial purpose or any other public display, performance, sale, or rental, decompile, reverse engineer, or disassemble the Content and the Collective Work, or transfer the Content or the Collective Work to another person or entity. You may not use any meta tags or any other “hidden text” utilizing Ryder’s name or trademarks without the express written permission of Ryder, which permission may be withheld in Ryder's sole discretion. You agree that you will not use any robot, spider, scraper, deep link or other similar automated data gathering or extraction tools, program, algorithm or methodology to access, acquire, copy or monitor the Site or any portion of the Site or for any other purpose, without Ryder’s express written permission which may be withheld in Ryder’s sole discretion. Additionally, you agree that you will not: (i) take any action that imposes, or may impose in Ryder’s sole discretion an unreasonable or disproportionately large load on Ryder’s infrastructure; (ii) copy, reproduce, modify, create derivative works from, distribute or publicly display any content (except for your personal information) from the Site without the prior written permission of Ryder and the appropriate third party, as applicable; (iii) interfere or attempt to interfere with the proper working of the Site or any activities conducted on the Site; or (iv) bypass Ryder’s robot exclusion headers or other measures Ryder may use to prevent or restrict access to the Site. Notwithstanding the foregoing, Ryder grants the operators of public search engines permission to use spiders to copy materials from the Site for the sole purpose and solely to the extent necessary for creating publicly available search indices of the materials on the Site, but not caches or archives of such materials. Ryder reserves the right to revoke these exceptions either generally or in specific cases. You shall not collect or harvest any personally identifiable information, including account names, from the Site. You shall not use any communication systems provided on the Site (such as Blogs or email) for any commercial or solicitation purposes. You shall not solicit for commercial purposes any users of the Site without Ryder’s express, written permission, which permission may be withheld in Ryder’s sole discretion. You further agree not to: (1) use the Site in any manner that could disable, overburden, damage or impair the Site or interfere with any other party’s use of the Site; (2) use any manual process to monitor or copy any of the material on the Site or for any other unauthorized purpose without our prior written consent; (3) use any device, software or routine that interferes with the proper working of the Site; (4) introduce any viruses, Trojan horses, worms, logic bombs or other material which is malicious or technologically harmful; or (5) attack the Site via a denial-of-service attack or a distributed denial-of-service attack. When you visit the Site or send email to Ryder, you are communicating with Ryder electronically. You consent to receive communications from Ryder electronically. Although Ryder may choose to communicate with you by regular mail, Ryder may also choose to communicate with you by email or by posting notices on the Site. You agree that all agreements, notices, disclosures and other communications that Ryder provides to you electronically satisfy any legal requirement that such communications be in writing. There may be provided on the Site links to other websites belonging to Ryder’s advertisers, business partners, affiliates, and other third parties. Such links do not constitute an endorsement by Ryder of those websites, nor the products or services listed on those websites. Ryder is not responsible for the activities or policies of those websites. Ryder does not endorse or recommend the products or services of any particular advertiser, business partner, affiliate or other third party. Ryder does not guarantee that the terms, prices or rates offered by any particular advertiser, business partner, affiliate, or other third party on the Site are the best terms, best prices or lowest rates available in the market. You acknowledge and agree that these third parties are solely responsible for any products or services they may provide to you and that Ryder shall not be liable for any losses, costs, damages or claims in connection with, arising from or related to your use of a third party’s products or services. It is Ryder’s policy to comply with the Digital Millennium Copyright Act, title 17, United States Code, Section 512, including, without limitation, responding to notices of alleged copyright infringement, and other applicable intellectual property laws. Ryder shall in appropriate circumstances disable and/or terminate the accounts of users who may infringe or repeatedly infringe the copyrights or other intellectual property rights of Ryder and/or others. Ryder will take reasonable steps to promptly notify the Subscriber that Ryder has removed or disabled access to the material. Ryder will replace the removed material or cease disabling access to the removed material not less than ten (10), nor more than fourteen (14) business days following receipt of the Counter Notification, provided Ryder’s designated agent has not received notice from the Complaining Party that an action has been filed seeking a court order to restrain the Subscriber from engaging in infringing activity relating to the removed material on Ryder’s network or system. THE SITE AND ALL CONTENT, SERVICES AND PRODUCTS ASSOCIATED WITH THE SITE ARE PROVIDED TO YOU ON AN "AS-IS" AND “AS AVAILABLE” BASIS. 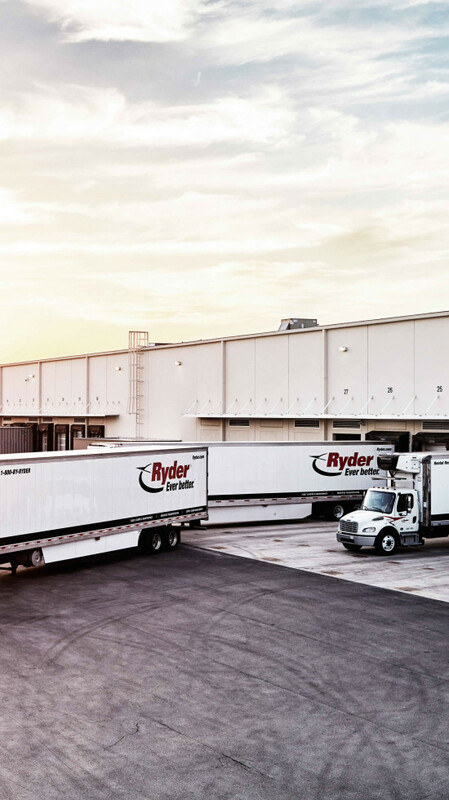 RYDER MAKES NO REPRESENTATIONS OR WARRANTIES OF ANY KIND, EXPRESS OR IMPLIED, AS TO THE OPERATION OF THE SITE OR THE INFORMATION, CONTENT, MATERIALS, PRODUCTS OR SERVICES INCLUDED ON OR ASSOCIATED WITH THE SITE. YOU EXPRESSLY AGREE THAT YOUR USE OF THE SITE AND ALL PRODUCTS AND SERVICES INCLUDED ON OR ASSOCIATED WITH THE SITE IS AT YOUR SOLE RISK. CERTAIN THIRD-PARTY PROVIDERS OF PRODUCTS MAY SEPARATELY PROVIDE LIMITED REPRESENTATIONS AND/OR WARRANTIES REGARDING THEIR PRODUCTS. THIS DISCLAIMER DOES NOT APPLY TO SUCH PRODUCT WARRANTIES. The Site is controlled and offered by Ryder from Ryder’s facilities in the United States of America. Ryder makes no representations that the Site is appropriate or available for use in other jurisdictions. If you access or use the Site from other jurisdictions, then you do so by your own volition and are solely responsible for compliance with local law. YOU SPECIFICALLY ACKNOWLEDGE THAT RYDER SHALL NOT BE LIABLE FOR USER GENERATED CONTENT OR THE DEFAMATORY, OFFENSIVE OR ILLEGAL CONDUCT OF ANY THIRD PARTY, AND THAT THE RISK OF HARM OR DAMAGE FROM SUCH USER GENERATED CONTENT AND THIRD-PARTY CONDUCT RESTS ENTIRELY WITH YOU. YOU AND RYDER AGREE THAT ANY CAUSE OF ACTION ARISING OUT OF OR RELATED TO THE SITE MUST COMMENCE WITHIN ONE (1) YEAR AFTER THE CAUSE OF ACTION ACCRUES. OTHERWISE, SUCH CAUSE OF ACTION IS PERMANENTLY BARRED.